We are a leading Manufacturer of lock pin for mast pin from Kolkata, India. A wide range of Spare Parts Item is made available by us to our valued customers. Widely applicable in the oil drilling processes, these spare parts are highly demanded in the market. 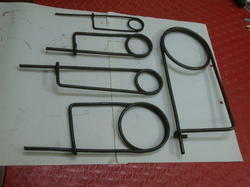 These spare parts are manufactured using a wide variety of quality materials that are procured from reputed vendors. Those materials include rubber, steel, and various metals. Bulk quantities of these products are readily made available by us for the convenience of our customers. LOCK PIN FOR MAST PIN. ALL SIZES. 3MM, 4MM, 5MM & 6 MM ROD DIA. Looking for MAST PIN & LOCK PIN ?